As I choked back the tears, I gave daughter one last hug goodbye before climbing into the truck. We not only bid farewell to our daughter but also said goodbye to our beloved Colorado for the year. It was a great summer filled with plenty of discoveries and new-found friendships. We already look forward to next summer. Alas with frost nipping at our heels, we set off on our 1,125 mile journey to Lake Mead, Nevada. We were on a mission …. 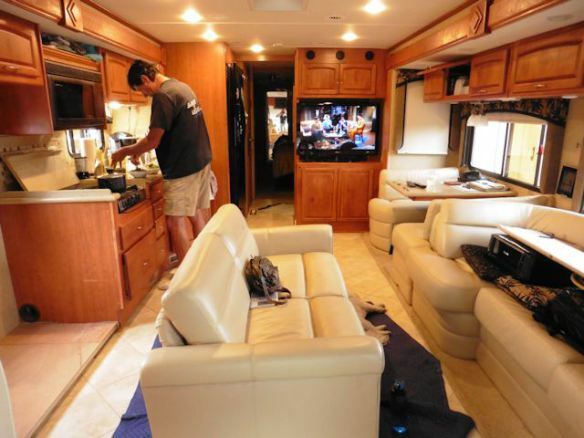 a mission that entails redecorating the RV. We’ve now been living full-time in the RV a little over a year and although I don’t miss living in a sticks n bricks house, I do miss certain niceties. One of which is our beautiful leather couch and loveseat. I really miss that couch and loveseat. Before the movers showed up to haul them off to the storage unit, hubby and I even contemplated swapping out the RV couch for our leather loveseat. It unfortunately just wasn’t going to work. So we hit the road as is over a year ago. But the RV couch has remained a source of discontent for both Al and me. I hate the chenille fabric and really miss the leather. 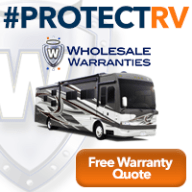 I’ve continued to shop online off and on for a new RV couch ever since hitting the road full-time and a tentative plan to head to Elkhart, Indiana, in the summer of 2015 was being discussed. This is the couch the RV came with. I do like the storage drawer so storage is an issue with anything new I pick. We spent more time hanging out with Linda and Mike as our paths continued to crisscross during the months of April, May, and June. 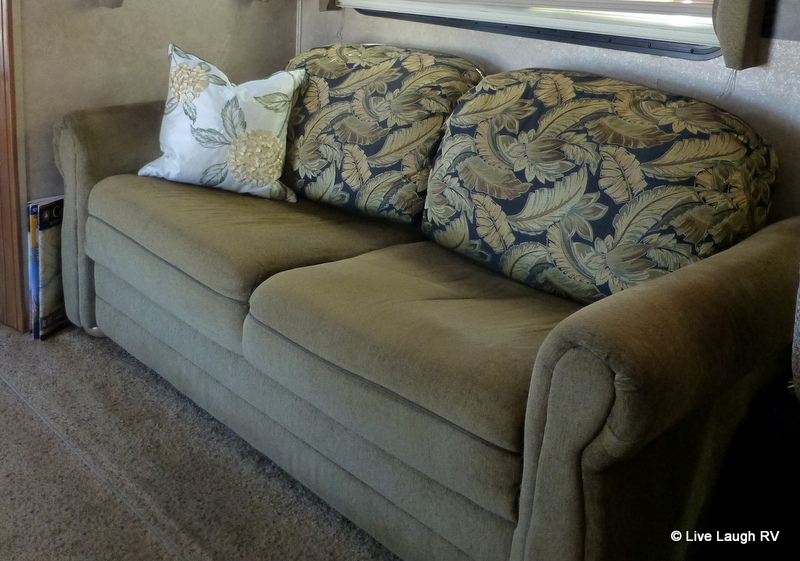 Each time I stepped into Linda’s RV, I continued to longingly eye that loveseat but contained myself from saying, “When can I have the loveseat huh, huh, huh?” At that point they still hadn’t decided if they were going to go forward with the remodel. Fast track to September – just when I was convinced my loveseat shopping would need to resume and that trip to Indiana was inevitable, I received an email from Linda asking if we were still interested in the loveseat? “Dah, YEAH!” A price was quickly agreed upon and then talks ensued for the logistics to be worked out. We were in Denver, Colorado, and they were in Eugene, Oregon. We were separated by approximately 1,300 miles but our winter plans had us traveling in opposite directions. Where ever shall we meet? Lake Mead, Nevada, it is! You can read about Linda and Mike’s remodel here. It turned out great. Our new couch as it sits in the center of Linda and Mikes RV. For traveling, they had to strap it upside down to the other couch. They traveled like this for over 1,000 miles so their friends could enjoy this loveseat. I did call first dibs after all 😉 In all seriousness, we very much appreciated the above and beyond effort because they did have an opportunity to sell it in Oregon. Friends indeed! Linda and dog Lucy help supervise the guys as the couch comes out of Linda and Mike’s RV. 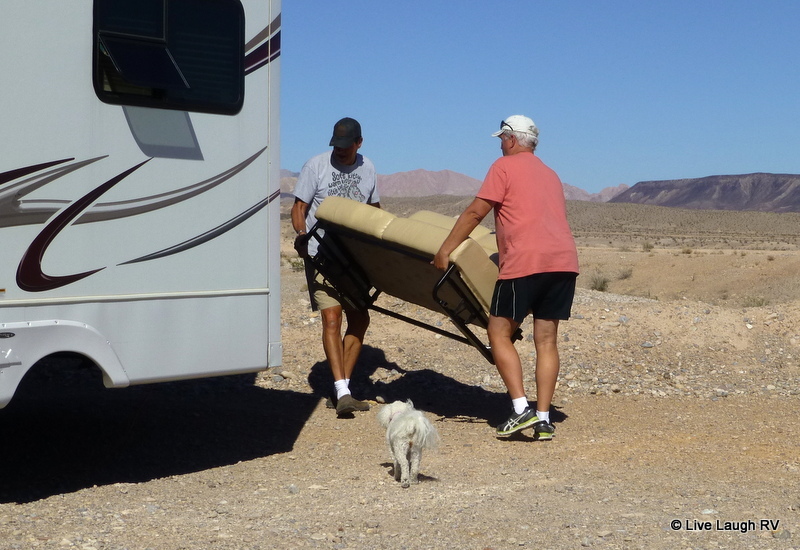 Lucy makes sure the guys don’t damage the couch as they take it into our RV. So now you know why we needed to go to Lake Mead….. to pick up our new loveseat. Let the remodeling commence. Come on, you didn’t think I would stop with a new couch. Nope, now there are chairs to reupholster…… and of course a few other things here and there, but all in due time and I’ll share it all in a future post once our DIY projects are complete. not a bad place to call home for a few days. 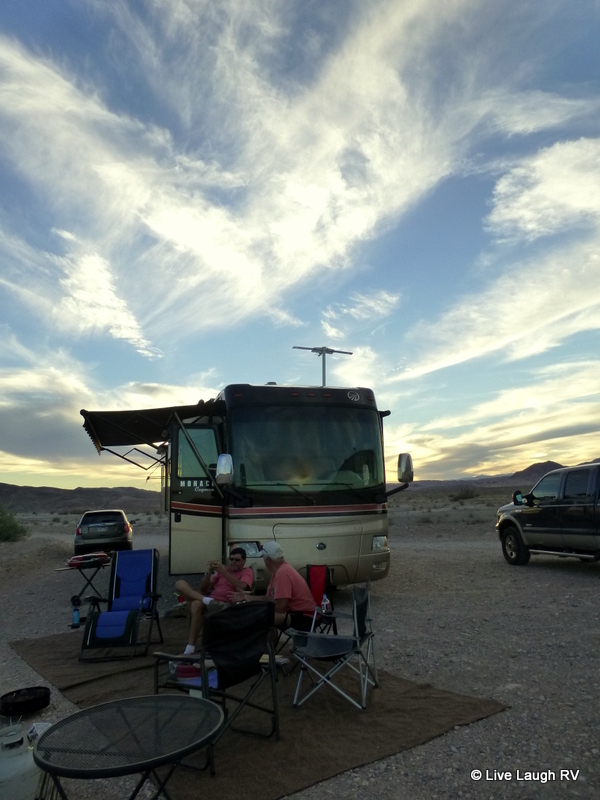 Boondocking with friends at Lake Mead. 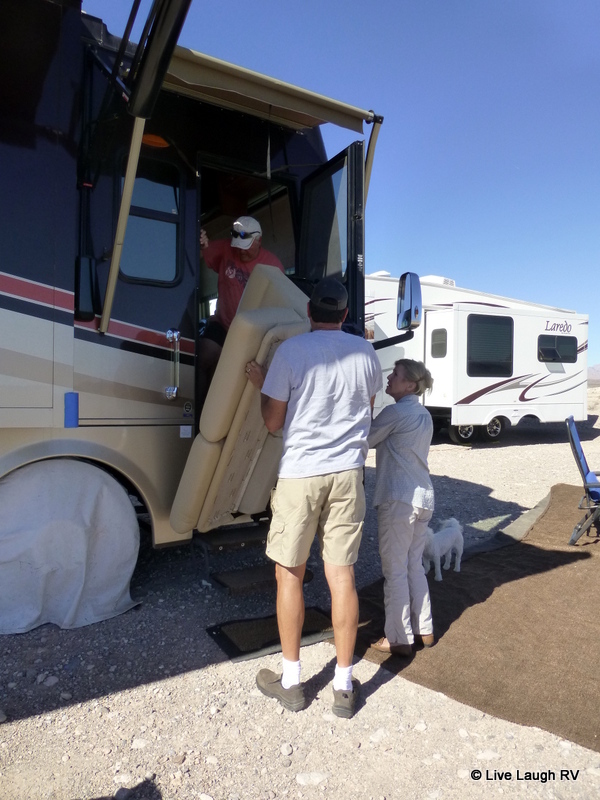 With the heavy lifting complete, what do two couples do boondocking in the desert in 100 degree heat with no air conditioning? But of course, sit in the shade, drink, eat, and solve all the problems of the world. After four days of desert dwelling and plenty of debauchery, it was in everyone’s best interest we bid farewell before we all needed to check into a detox center, but we do have plans to meet up again down the road. Perhaps more desert dwelling is needed. Eating well. We start the day off with a hearty ‘breakfast skilletini’… red potatoes and veggies with eggs on top with a side of bacon. Note – no bread involved…. Paleo eating all the way! Or how about starting the day off with fresh-baked banana muffins and zucchini bread? Paleo of course! I love my little RV oven. All alone boondocked at Government Wash at Lake Mead 😦 Time for us to move on as well. Al and I are now comfortably parked in familiar stomping grounds back at Lake Pleasant located northwest of Phoenix, Arizona, and not far from our son’s home. Our stop here will be short. We’ll get in plenty of visits with the son, take care of our DIY projects, and some RV repairs, then hit the road around the 24th. 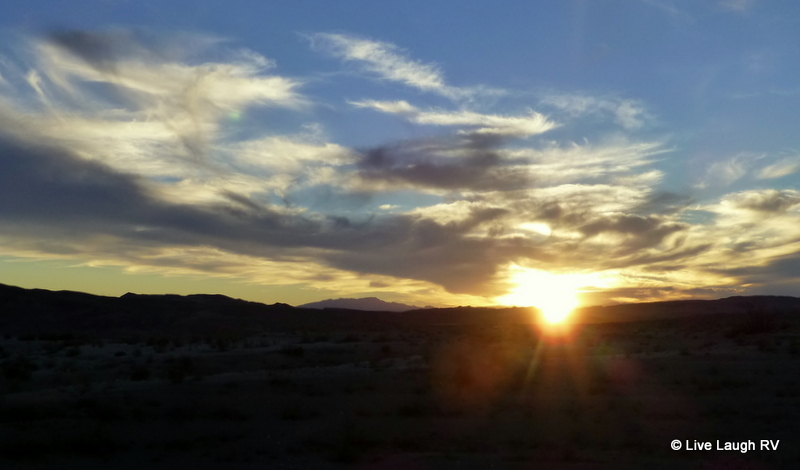 Until then, I’m thoroughly enjoying the desert sunsets….. they’re the best! What a yummy couch you got! Remodeling is such fun. Yes it is and we are really enjoying the leather couch. That’s great, Ingrid. I Love remodeling! I know there are so many more important things (mountains, canyons, sunsets, endangered species . . . Whooping Cranes, for crying out loud!) but if life had no remodeling in it, I know I’d miss it. My hub and I have never seen a wall we wouldn’t want to knock out, and, well . . . . Can you do that to an RV? Maybe not. But have fun with the new sofa – awesome; and getting chairs recovered; and wouldn’t you like to build in a little desk in a corner somewhere? Ok, I’ll stop; maybe you already have a desk!! The desert sunset picture was gorgeous! Good luck on the remodeling. Congrats on the new couch – always great when a plan comes together. The last shot is awesome. Tonight was another stunner of a sunset and I don’t even have to step away from the RV to enjoy! Positively stunning sunset, Ingrid. What a great capture! How lucky that you and your friends could work out a deal for that leather loveseat. A win-win if ever there was one. Wow, Linda and Mike are truly great friends! I am looking forward to step in into your remodeled home. See you in Texas, we need to open our bourbon and share it with you! Keep those desert sunsets coming, I missed them! Btw, the crossbody shoulder bag that you recommended arrived last week. it was from Japan! I really like it. Thank you so much, Ingrid! Hope you enjoy that new sofa. Looks lovely. Lovely sunset. Enjoy all your time with your son. Make lots and lots of memories. Leather…..dreamy!!!! Some things just make home….have our eye on a couple new pieces but sure you’ve read of our repairs saga. Sleeping at dealer, thought we had a fix, now more trouble today. They may have to take the entire slide off whenever they can get parts. Better than loosing a limb! Enjoy your travel mode again…some day we’ll figure out how to do that right. Living the dreammmm….. Still with dealer, major slide problem. Keystone says, we have to bring to Elkhart, then learning warranty null and void if full timer, but dealer at bat with them to fix here if they can figure how to take off and rework. Guessing a few weeks in this parking lot! 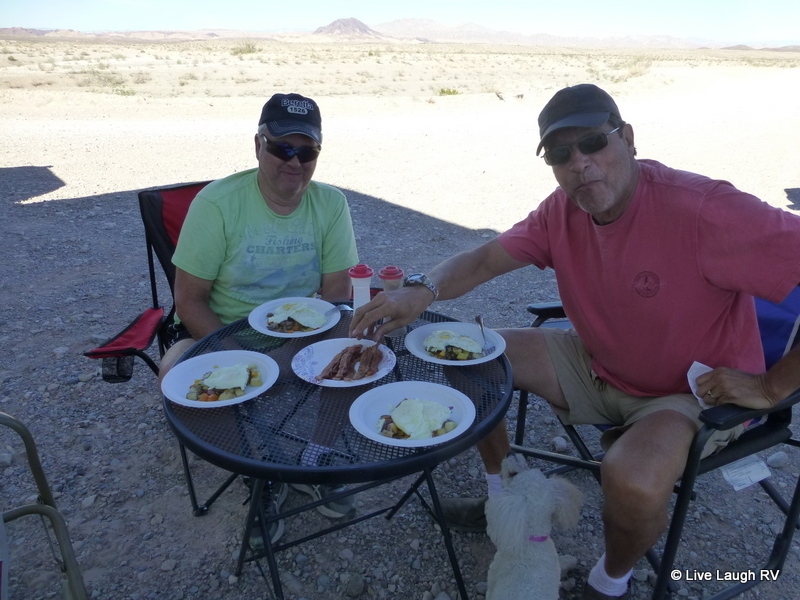 It’s not been pretty….flunking out with this RV adventure this year. Can I have a do over…. Texas? Good question…. I just sent you an email. Keystone is not a company that stands behind their product. It might be time to get nasty. I always cringe when I hear someone say “living the dream”…. it’s life. Chin up! Looks like some good eats there! I know you understand when it comes to the children as yours are located in different locations as well. We love the new couch and it looks really nice in our RV. Linda and Mike are definitely “good people”. We certainly weren’t going hungry OR thirsty 🙂 Good times! Aren’t remodels just the best? You finally get to decide what you really need and have to change after living in it for a while. Great job in snagging the leather couch. 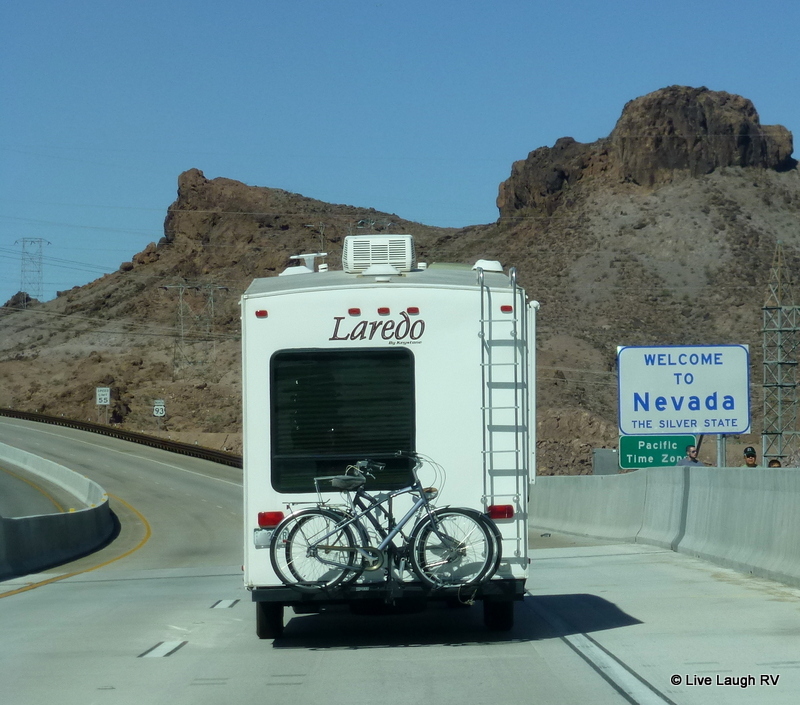 How do you get those great shots of the RV as you travel? Are you running behind the RV? Do you have a small wagon and a long rope where you and your camera follow for those shots? Inquiring minds want to know. Yes, the remodeling is coming along and looking so much more to my liking. Those photos? It’s called traveling with two vehicles. I follow behind the RV in my little red truck snapping shots. We’ll leave the truck at our sons home when we head to Texas. Stunning sunset Ingrid. I can’t think of many better things than friends, desert, a new creamy leather couch and, of course, a little debauchery…..tee hee I hope we cross paths next year…. Love the new couch Ingrid. The inside of Linda and Mike’s RV looks really spacious. I think I could definitely cope with that. What great friends they are to bring your love seat all that way. Your breakfast looks really good, and those muffins…..Mmmm! Linda’s RV is 40′ long and VERY spacious. Yep, us Americans like things big LOL. And those muffins are my faves! Every time I visit your blog I am inspired to head towards our RV supplier. It is a fun lifestyle especially in a country like the U.S. which is huge and offers so much diversity. I’m lovin’ that new couch!! !We are in need of a change up, but not sure if we need to just upgrade the whole schlameel…Our Hiker is a 2007, which makes it 7 years old. Actually, it’s in pretty good shape, but the graphics are peeling on the front..Dennis says that is NO reason to trade it in…We actually almost never sit in our couch and us our rocker recliners, but those are getting to look a bit like Goodwill Store…decisions decisions..I sure envy you those sunsets…nothing like it in this world except Arizona deserts!! Wonderful to get your new comfy couch! That sunset photo is incredible Ingrid. enjoy the new furniture and safe travels. The trip to Lake Mead was well worth the drive! We enjoyed laughing and relaxing with friends and gobbling up all your great homemade goodies. And you got a few pics of our little hangout. I might have to steal one for my blog update! Miss you guys. See you next year! yay for the new couch! Hope your remodel stuff goes great and that you get lots of quality time with your son before heading to your next destination! How awesome! I debated posting the video and photos that the realtor contracted to have done but decided against it for fear of seeming too look-at-me. I’m really pleased with how it all turned out though. But I wanna see! I know what you mean though about the ‘look-at-me’ thing. Have you figured out where you’d like to move to once the house sells? Oh GAWD!! Don’t even get me started. House hunting has been the most soul-sucking endeavour EVER. So much GARBAGE out there. And the prices… FML! If we sell before we find anything suitable, we may be spending a LOT more time in Vegas. 🙂 Just kidding. Sort of. Worst case scenario, we may rent until we find something. I refuse to make a pressure decision and then hate where I live (or feel utterly gouged on the price). 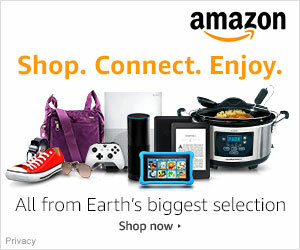 Wise move not to rush into a purchase. As a former Realtor and Home Builder I would see folks make some pretty stupid decisions because they didn’t want to move twice. Yes pls send me the link…..
You could always rent an RV and temporarily join in some debauchery! Mind you, we certainly don’t need a ‘remodel’ to keep us busy, but the place is feeling more to our liking with each completed project. It won’t be long and you and Linda will be off in your own RV wondering ‘whatever was I thinking?’ 😉 It’s an adventure! Yes, but we have probably had one of the mildest, driest autumns on record. Just out for a couple of week. Then a longer break Christmas when the weather will have hit the island. Wow, that worked out perfectly, but we didn’t get to see the finished product in your Rig. 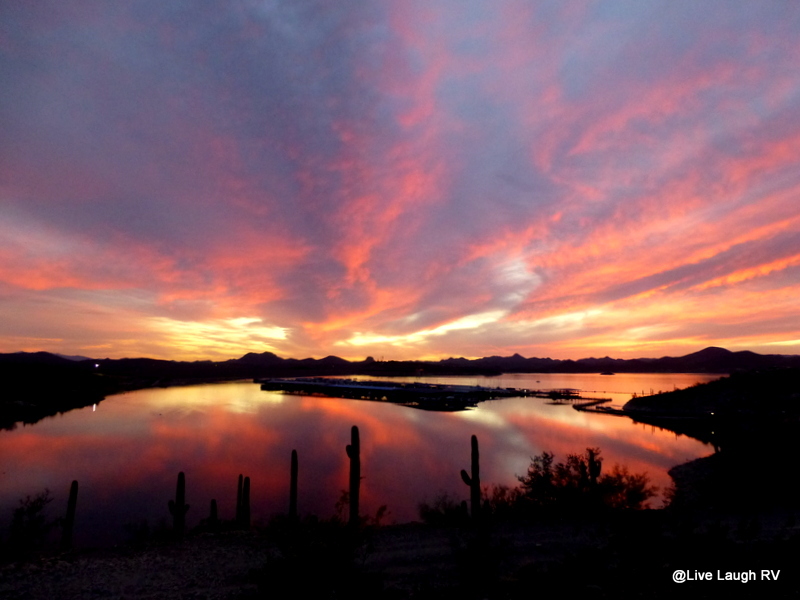 Welcome back to AZ and hope you enjoy Lake Pleasant. Look forward to catching up with the two of you at McDowell Mountain or Cave Creek this winter. Enjoy! A home needs to be home sweet home with all the comforts, especially being road warrior nomads 🙂 My parents RV pretty much 365 and had to total their RV in July due to flooding and it being underwater. They are getting use to the new RV and once hit my brother’s place will be doing some work on it to make it more homey for them and their lifestyle. Happy Day! Gosh, that is way too bad about your folks RV getting flooded. 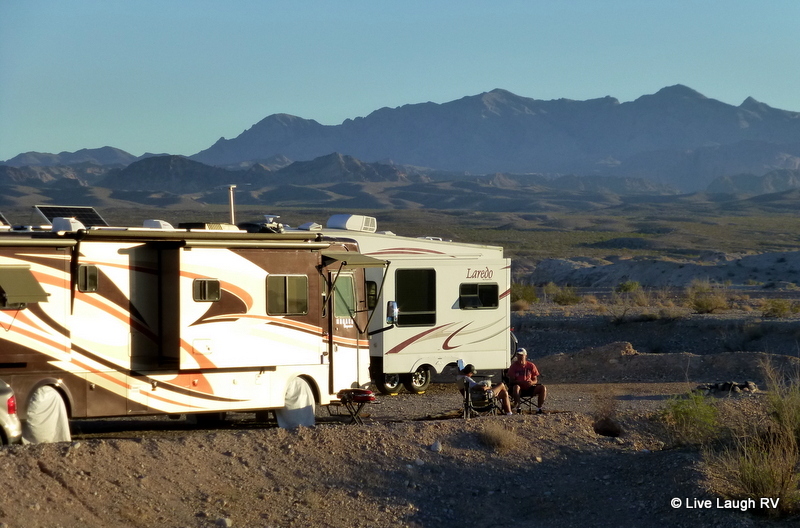 A RV is like any other home, it takes awhile to put one’s own stamp on it and make it comfy. Where was the RV located when it got flooded? There were in Southern MN where I think the one river near the RV park meets up with 1 or 2 more major rivers – just a bad spot. It happened at like 2 am in the morning and by the time they realized what was going on they were stuck in the mud with the water rising. Yikes, what a horrific situation. Bad weather in a RV is always a scary scenario. Hopefully your folks like their new RV. They are just trying to get use to living in it – having moved things around a few times already – ha! They have had the year from heck. Left their home base where it was raining (lightening struck close by their RV too) and then pretty much rained for quite some time in MN and then the flooding. Now they are heading back to home base and experiencing not so nice weather once again. They should be resilient like silly putty after this year and RVing.